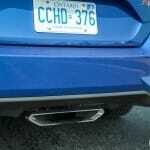 Still is one of the best cars under $30,000 for daily street and occasional performance driving. 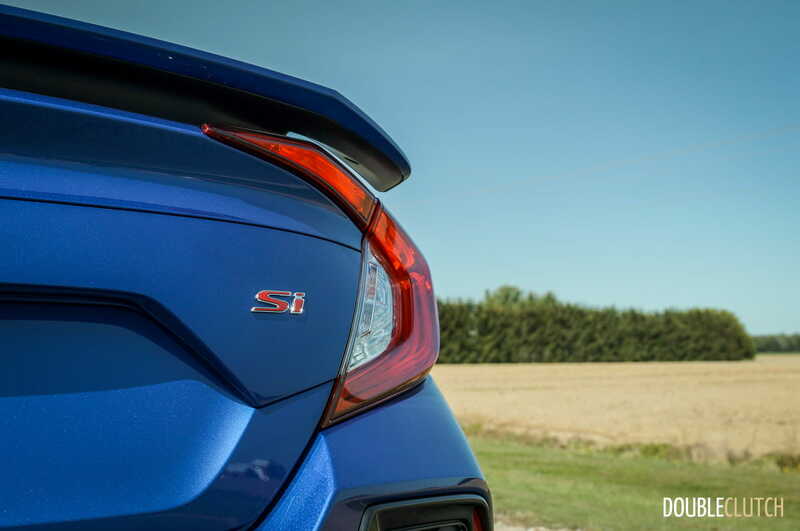 In its tenth generation, the 2017 Honda Civic Si Sedan represents the latest in the sportier range of Canada’s favourite passenger car. Available in coupe and sedan form, the formula for Si hasn’t changed a whole lot for the last thirty years: make it fun, make it cool, and make it affordable. 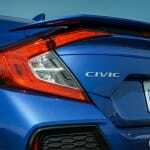 It has always been the go-to choice for the younger (or younger at heart) motorist looking for the best bang for their buck in terms of getting a lively vehicle for daily commutes or weekend track duty. 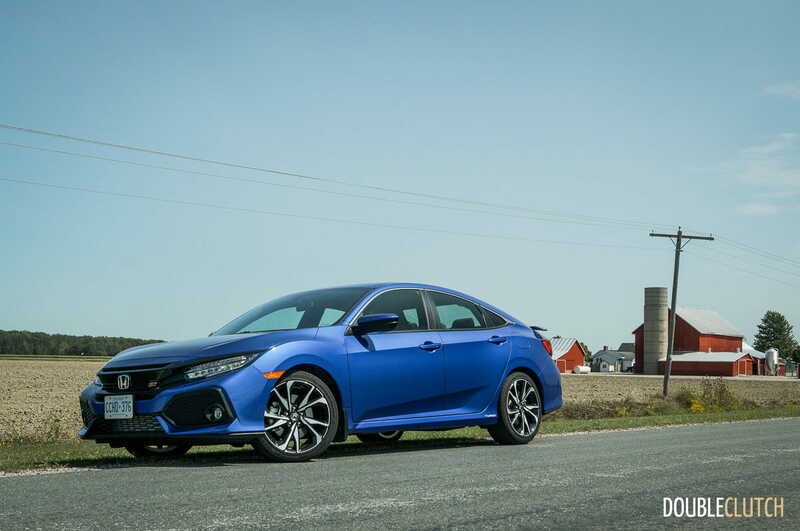 As fervent fans of the outgoing ninth-generation coupe and sedan (there hasn’t been an Si since the 2015 model year), the editorial team was very eager to get their hands on the latest Si (reviewed here). 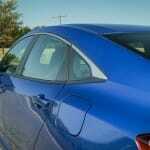 Having recently already tested the coupe, a more practical Aegean Blue Metallic sedan made its way into the garage for a week on test. 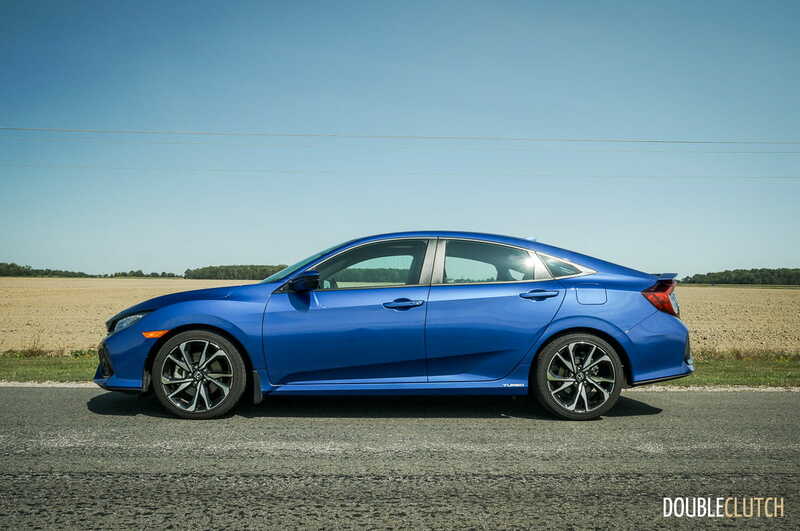 Even though it trades a bit of a the cool factor for an extra set of doors and added utility, the Civic sedan’s aggressive styling manages to make a bold, if not controversial statement all on its own. Beauty is in the eye of the beholder here! One of the most significant changes for the tenth-gen Si lies under the hood. Gone is the 2.4-litre naturally aspirated four eschewed in favour of a 1.5-litre turbocharged mill making the same 205 horsepower. 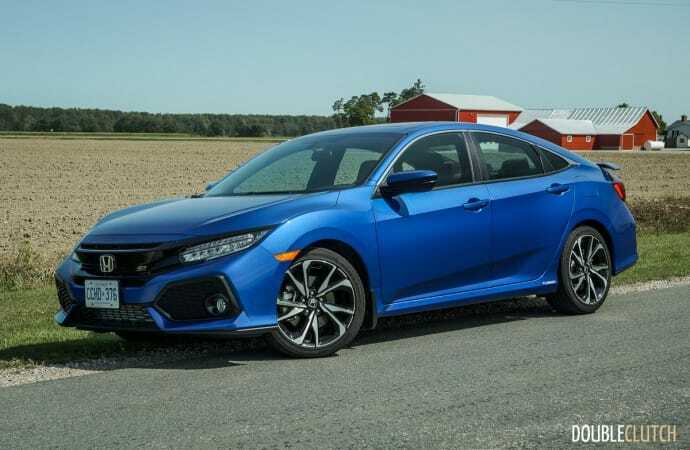 The big difference here is that the redline has been reduced from 7,000RPM to 6,500RPM, peak power comes at 5,700RPM instead of 7,000RPM, and the VTEC variable valve timing has been taken away in favour of the turbo. 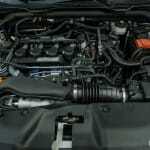 Torque is rated at 192 lb-ft. between 2,100 and 5,000RPM, which is a strong improvement over the previous 174 lb-ft at 4,400RPM. 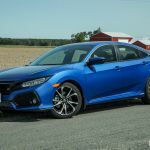 Much of the reason for these changes are due to tightening fuel economy regulations, and while the extra torque response is welcome around town, these numbers do seem to detract from the peaky, high-revving nature of olden-days Honda. 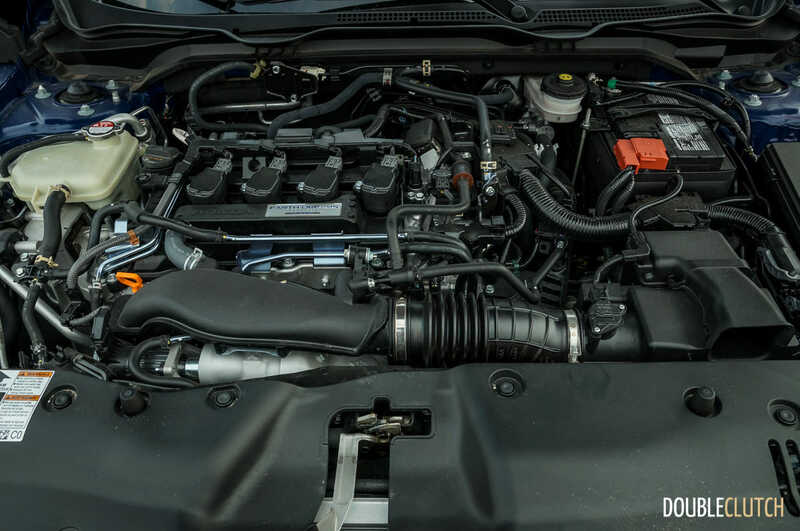 In the real world, the 1.5-litre turbo four pulls strongly once spooled up, and thankfully, the lag is kept fairly reasonable despite the use of a single-scroll turbocharger. 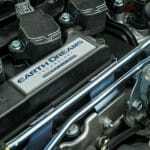 Those who are die-hards in natural aspiration and high-RPM horsepower may find the response to be inadequate, but there’s no question that the smaller boosted engine puts down stronger performance numbers all around. 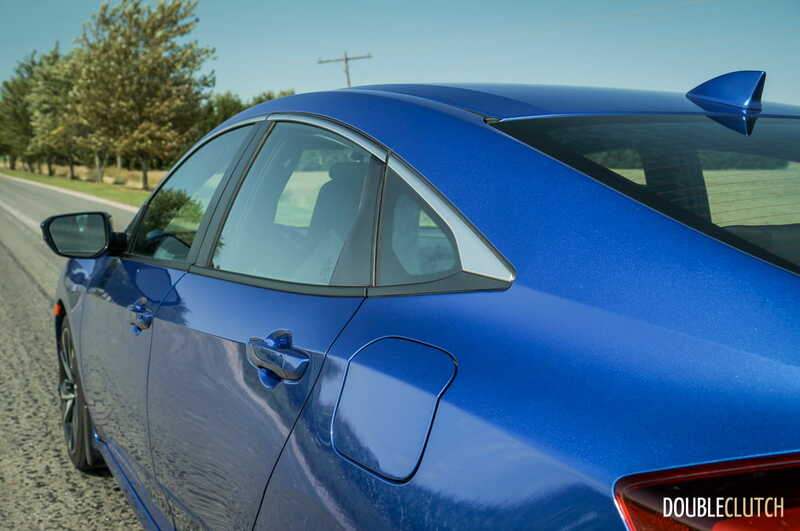 As the engine sweeps through its prairie-flat torque curve, it does fall off a bit towards the top end. Overall, it’s still a lot of fun, but does lose some personality when compared to the last car. 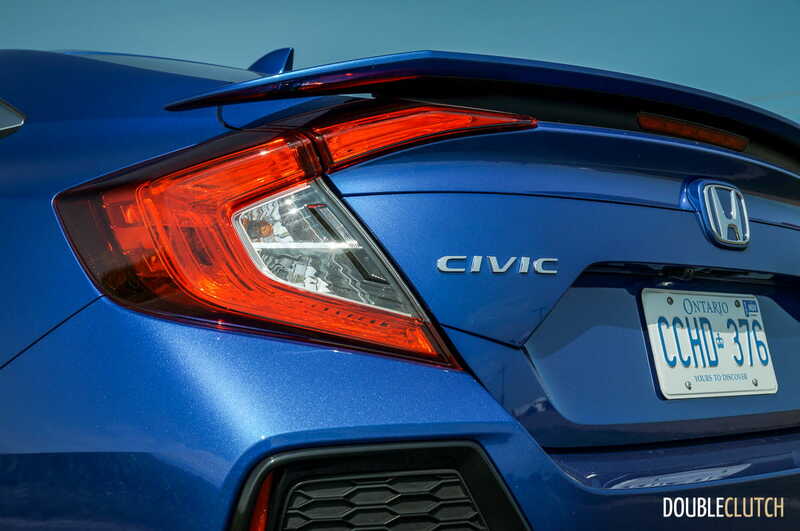 Rated fuel economy for the Si stands at 8.4L/100KM in the city, and 6.2L/100KM on the highway. 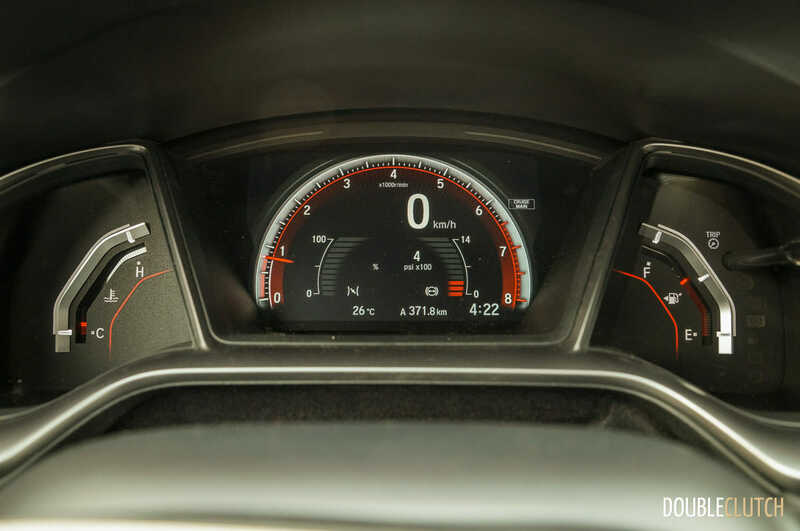 Observed economy over a week of testing returned 6.2L/100KM with mostly highway driving – expect true highway economy numbers to beat out the rated values with ease. 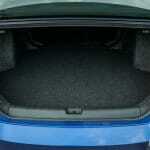 Fuel capacity is 46.9 litres, and premium fuel is recommended but not required. As with previous years, there’s only one transmission option for the Civic Si – those who need an automatic need not apply. 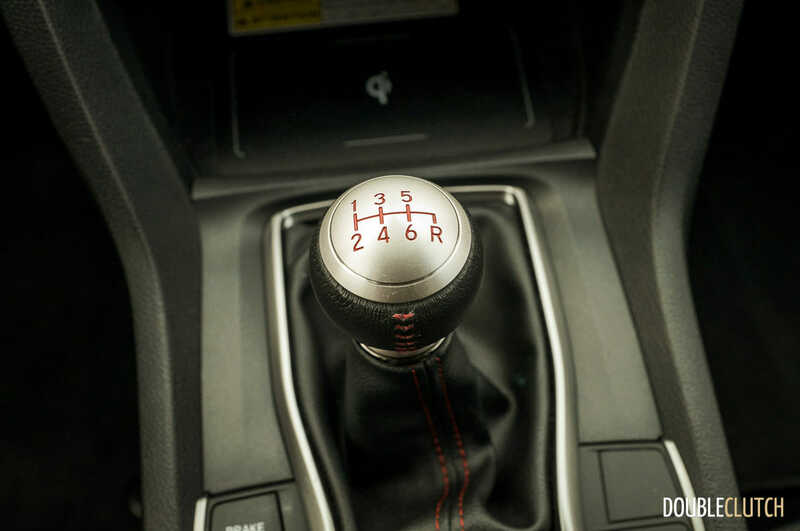 The tenth-gen’s six-speed manual uses a similar looking shifter and knob as before, but sadly, the linkage is not as crisp and engaging as the previous car. 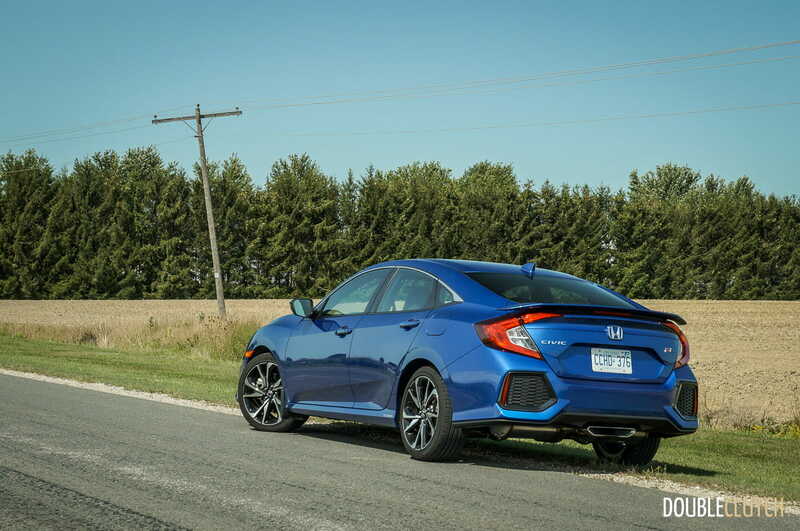 That said, it’s still plenty good, and among the best in class, right next to the likes of the Mazda3. 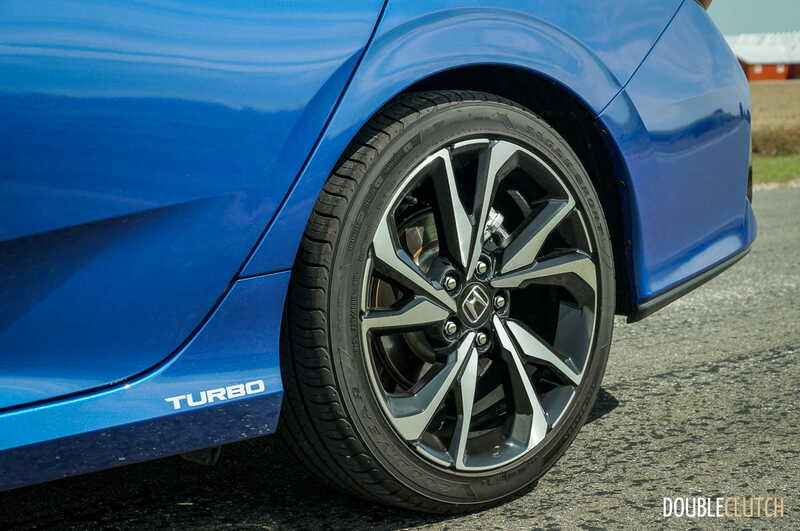 The clutch is very light, but easy to modulate, and makes city driving as easy as child’s play. 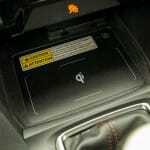 Pedal positioning is not quite ideal for heel-toe downshifts, but with a little more ankle action than average, it can be done. 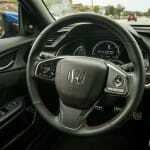 With the clutch and shifter combo living up reasonably well to Honda’s previous efforts, the bigger gripe lies in the institution of rev hang in between shifts. 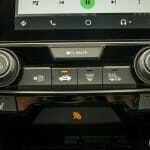 It’s more pronounced in the lower gears, and can make for either jerky or frustratingly slow shifts, depending on the driver’s patience and inputs. When releasing the throttle and depressing the clutch, the RPMs seemingly “hang” before slowly dropping down. Drivers have two options – they can either release the clutch and force the revs down, causing extra clutch wear and reducing smoothness, or they can wait disturbingly long to time a well-matched upshift. 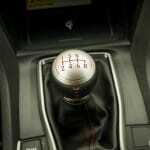 Not many cars see this phenomena, but it appears to correlate with engines that use continuously variable transmissions for their automatic variants (we’re looking at you, Honda and Subaru). 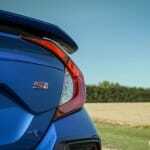 With the transmission anomalies out of the way, the 2017 Civic Si’s chassis is a relative masterpiece of fine tuning and modern engineering advancements. 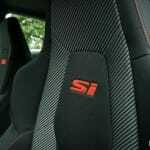 Going down the road, the ride has a very substantive and premium feel to it, owing largely in part to a very rigid chassis. 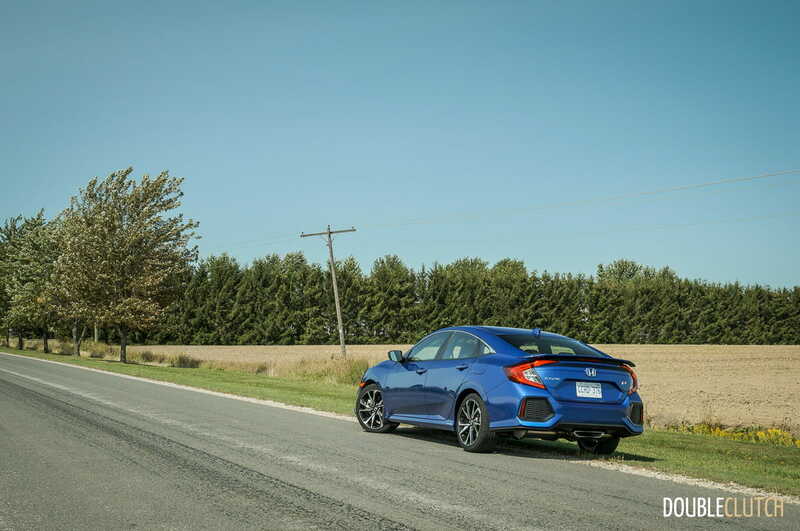 This also translates well when shoving the Civic into corners at speed – the two-setting adaptive suspension firms up in Sport mode – but neither setting can really be described as overly firm, but rather ‘good’ and ‘better’. 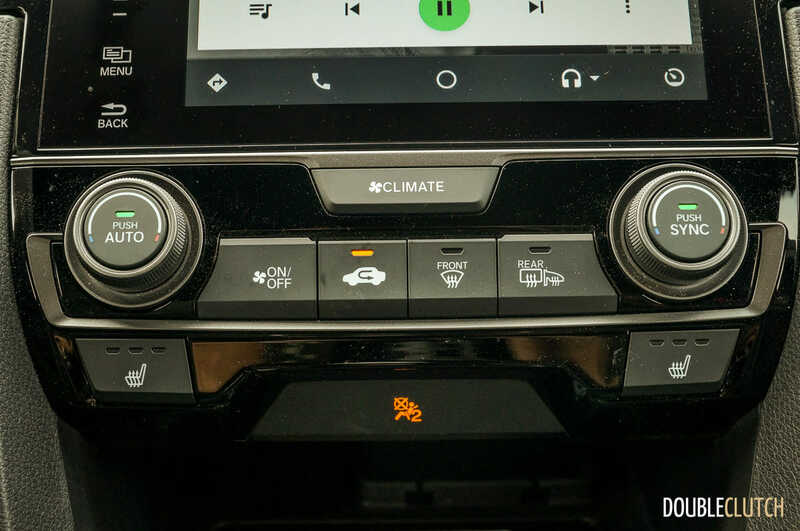 Combined with the lack of a need for stiff suspension, the steering is improved and is one of the better electric power steering assist implementations out there. 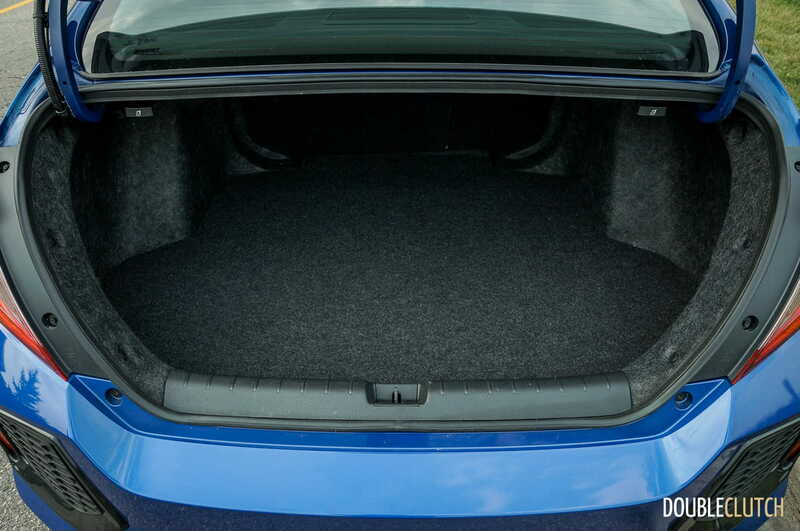 It’s well-weighted in all conditions, and seems to provide just enough feedback to be a good improvement over early electric assist systems that killed any and all steering feel. 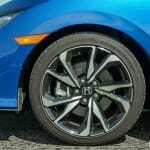 As with the last couple versions of the Si, a helical limited slip differential is standard equipment. 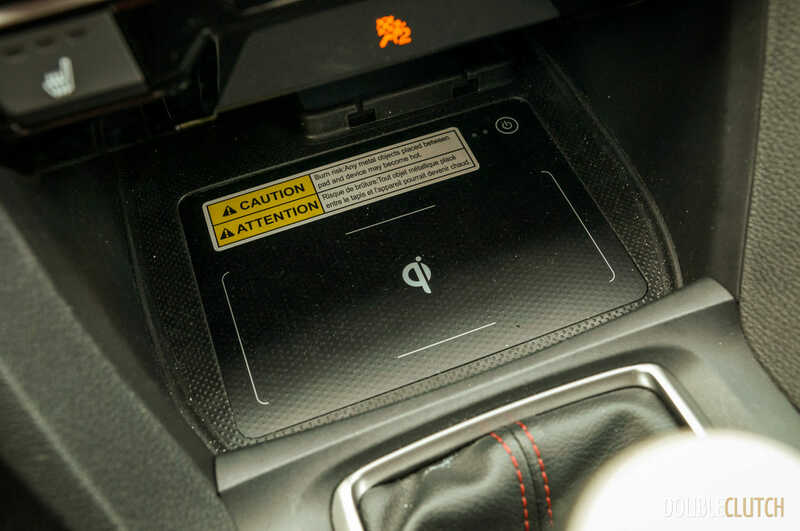 Traction coming out of corners is lightyears better than expected for a front-wheel drive car, with torque steer being limited to a slight momentary wiggle in the steering wheel as the differential engages and does its thing. 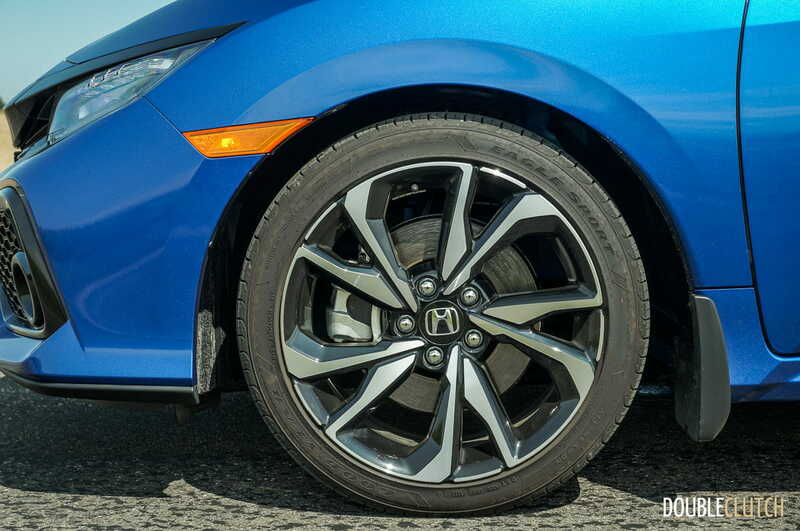 A set of 235/40 all-season Goodyear Eagle Sport tires on 18-inch alloy wheels also help to keep the squirminess in check – expect even better performance with dedicated summer rubber. 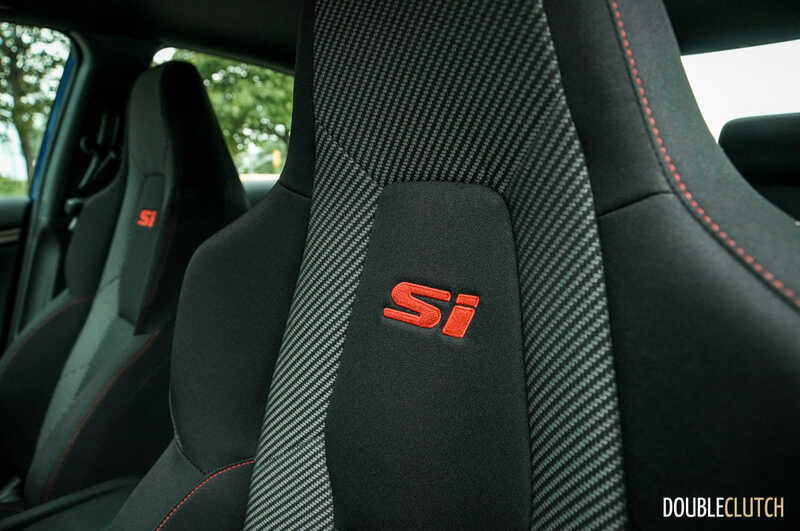 Inside, the Civic Si gets a few extras over the traditional Civic, including sport-bolstered cloth seats with one-piece seatbacks embroidered into the headrest. 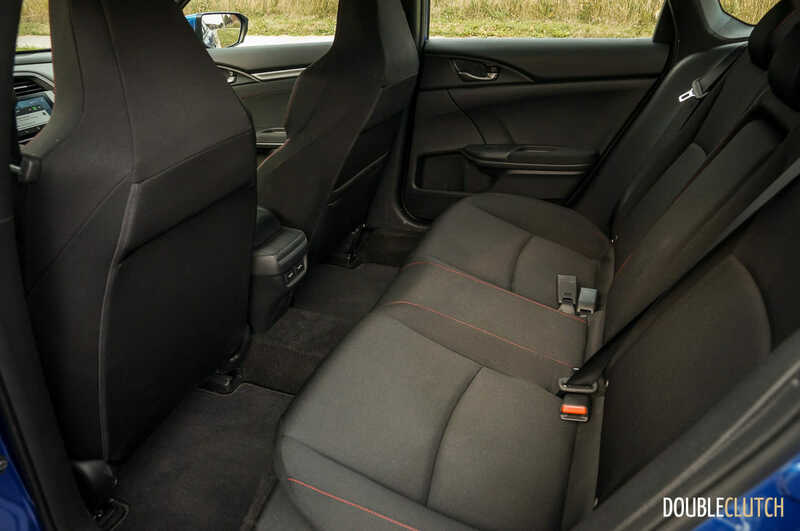 Rear heated seats are standard, and overall comfort all around is a strong suit, even on longer trips – the bolsters won’t kill you here. A series of performance-based gauge readouts are also available, including a g-force meter, a boost gauge, and shift warning lights. 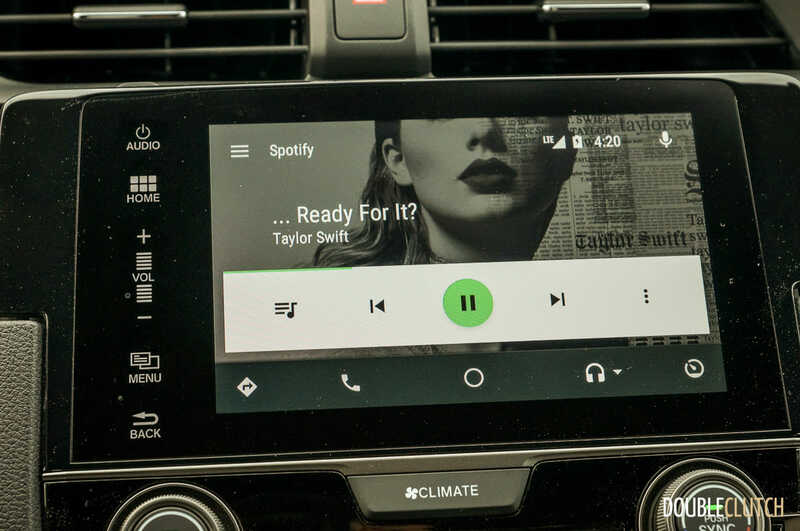 Android Auto and Apple CarPlay are standard equipment, although Bluetooth smartphone pairing and Android Auto kept getting disconnected and reconnected every thirty seconds unless text messaging and contact sharing were disabled. 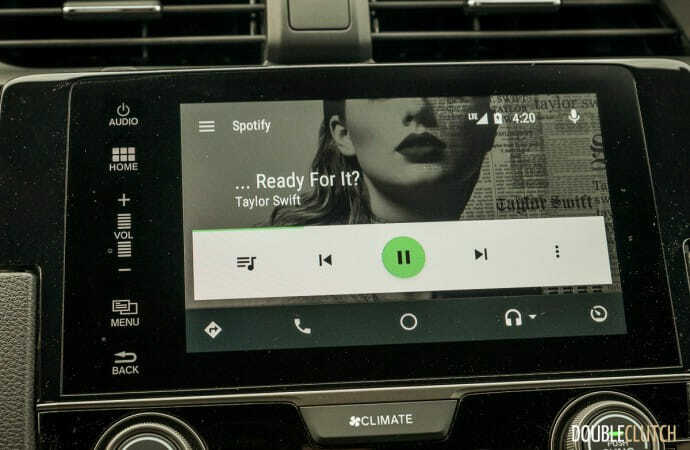 This appears to have also happened in previous 2016 and new Civics tested, and with different phones used. 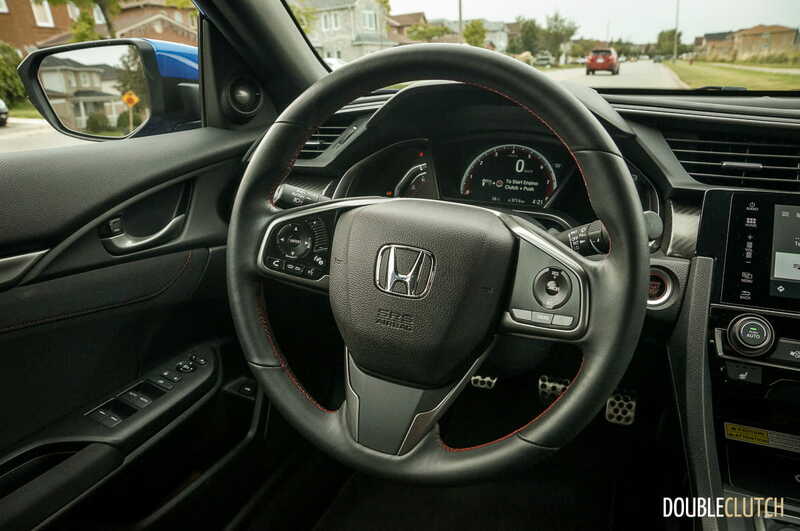 Most importantly, the absence of a volume dial is a major ergonomic faux-pas, but Honda appears to be listening. 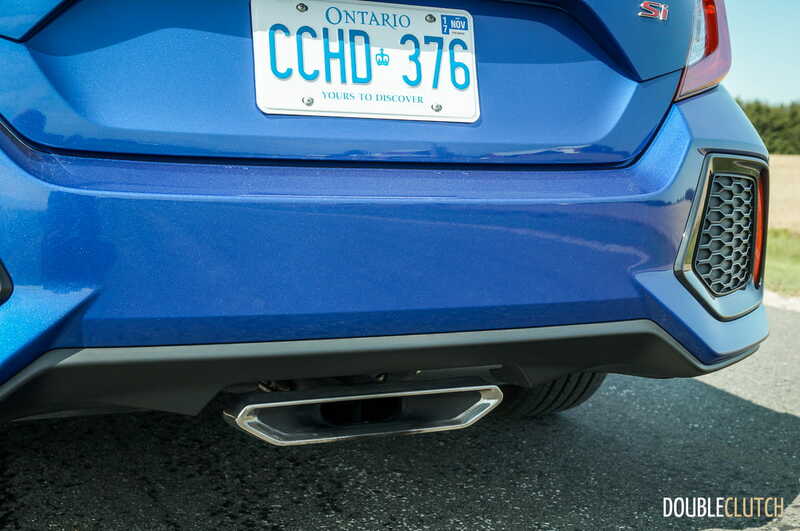 Expect this to be corrected in future Civics, as the newer CR-V (reviewed here) already has this complaint addressed. As is typical for Honda, no options are available for each trim level, and the Si comes pretty well loaded at its $28,490 as-tested price. 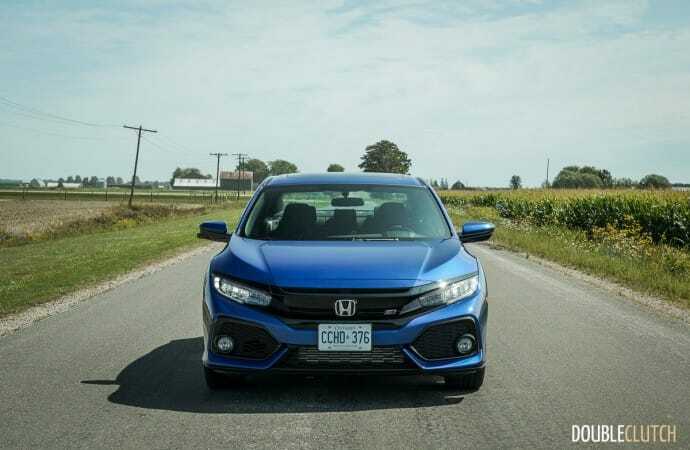 There’s a power sunroof, LED headlights, rear wing spoiler, dual-zone automatic climate control, the aforementioned rear heated seats (don’t worry, front passengers get heat too), a centre-mounted exhaust, Honda LaneWatch blind spot display camera, and voice-activated navigation. 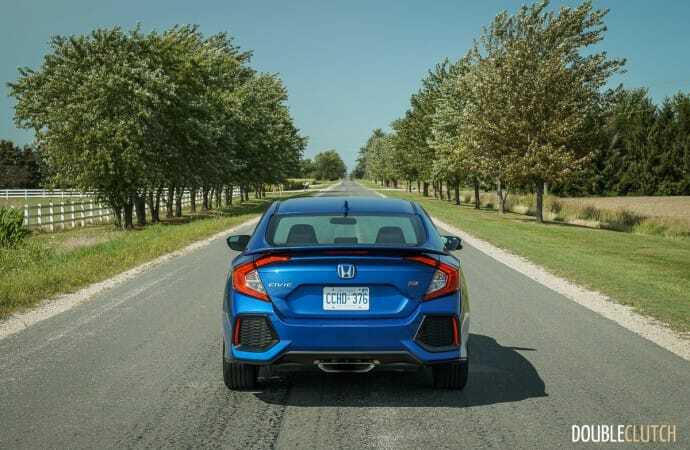 There’s no Honda Sensing safety suite (forward collision warning and braking, lane keep assist, adaptive cruise), as the system seems to be reserved for Hondas equipped with automatic transmissions only. 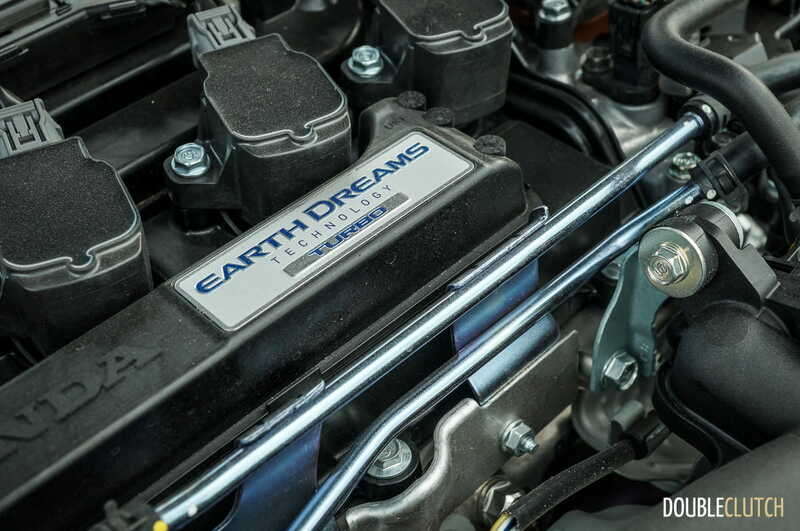 With excellent chassis tuning, great steering, and the limited slip diff, the top-notch driving dynamics all come together to make a car that can take high-speed corners with impressive confidence and stability. 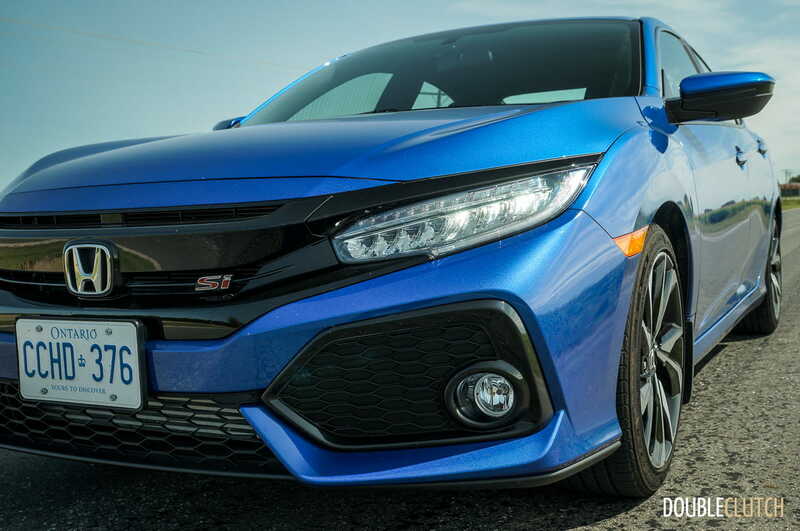 In fact, it very much feels like a milder version of the fire-breathing, physics-defying Civic Type R. While not as intense and sharp, bear in mind that there is a $13,000 price delta between the two, which can grow even larger due to the scarcity of the Type R driving prices up. 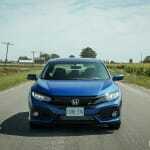 There will be the inevitable comparison to the likes of the Subaru WRX (reviewed here), Volkswagen GTI, and Ford Focus ST, but car enthusiasts need to be reminded that these options all cost several thousand more for a similarly equipped vehicle that doesn’t necessarily drive and feel any better in day-to-day use. The 2017 Honda Civic Si Sedan may be a little bit down on power and the powertrain may no longer be as sweet as it used to be, but it still is one of the best cars under $30,000 for daily street and occasional performance driving.